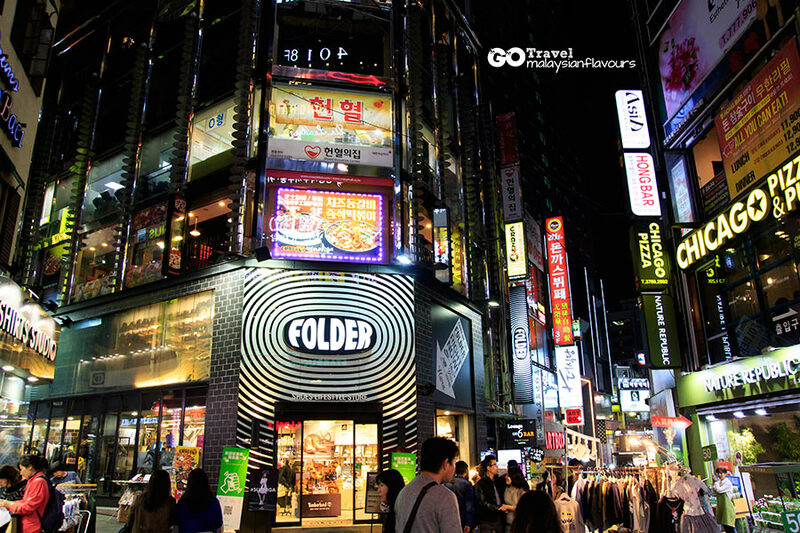 Myeongdong is considered a tourist attraction in Seoul, South Korea. Call it a shopping paradise overwhelmed with cosmetic shops and clothes boutiques that you can shop till you drop, together with tons of Korean street food, cafes, restaurants to fill your tummy in between shopping. 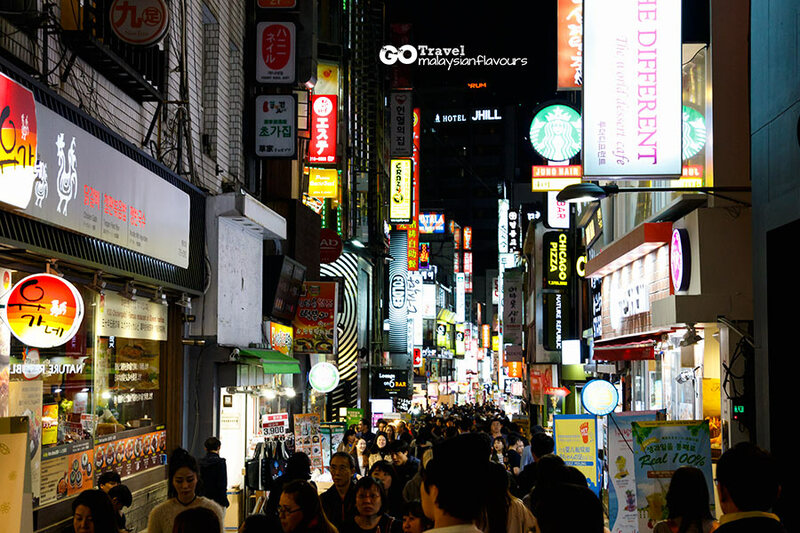 However, comparing to Hongdae (Hongik University) and Ehwa station, Myeongdong is the place we like the least. Why? Read on. 1) To us, it is too crowded during night time. Like a night market but not as interesting. 2) A lot of cosmetic shops but similar from one street to another. Even if you miss the shop in street A, you will always see it back in street B and C and D. Some longer street, you can see the same brand 2 to 3 times. 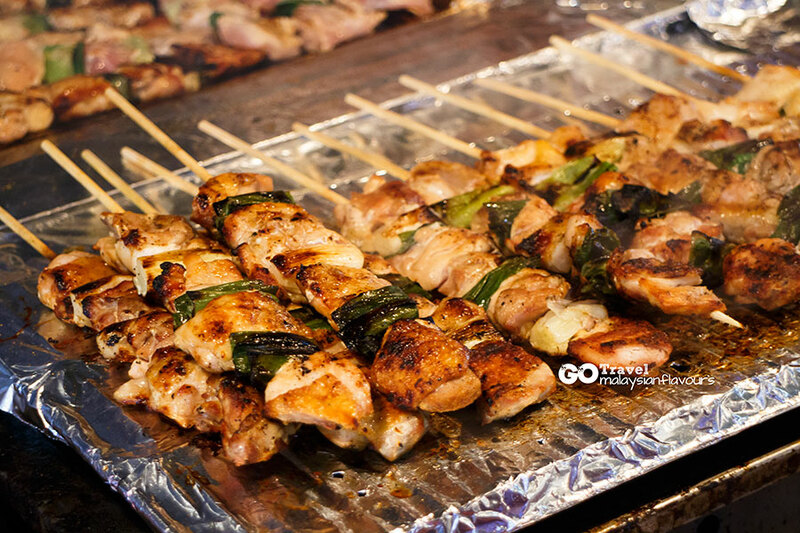 3) Street food in Myeongdong doesn’t taste as good, higher price too. 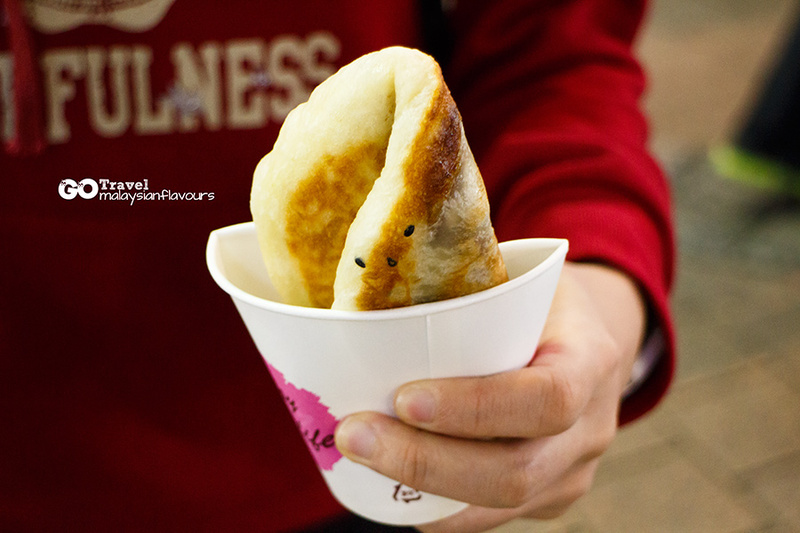 A sweet pancake is 1000won in Ehwa and in Myeongdong, price is double up to 2000won, some for 3000won. 1) You love buying cosmetic. Varieties are better than you see in HERMO. Packaging are cute too, ideal as souvenir. 2) You wish to purchase in larger quantity, for example, mask. You can always get it in cheaper price. They sell in bulk, 3 to 4 dozens of mask tied together, I think I can use it for 3 years. 3) Language barrier is lessen in Myeongdong, if you can speak Mandarin. Most staffs in these shops are well-trained to communicate with visitors over simple Mandarin. English wise, still a problem as most of the time, they misinteprete what we trying to ask. The must have. 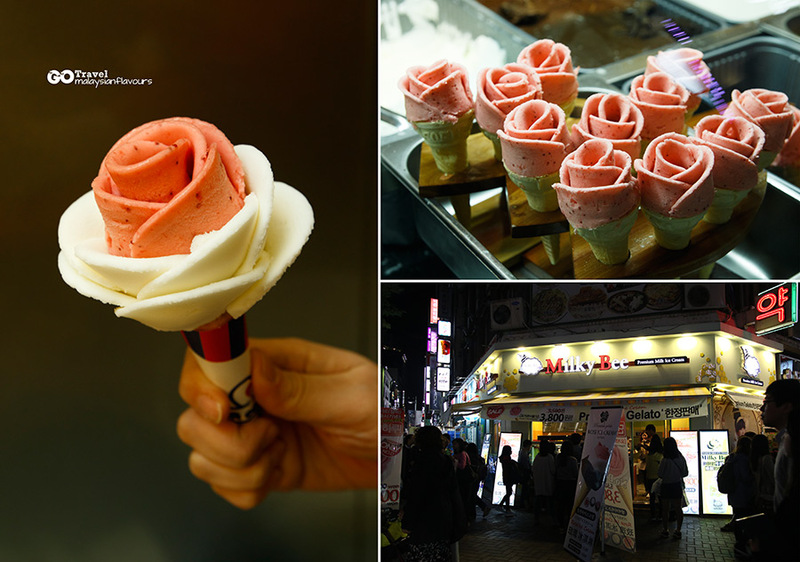 Quite a brilliant idea to come out with ice cream in rose shape. You will easily come across this store opposite to MCM. If you came from MyeongDong MTR, from exit 8, turn left at the first cross-junction, walk straight for 3 minutes to reach. 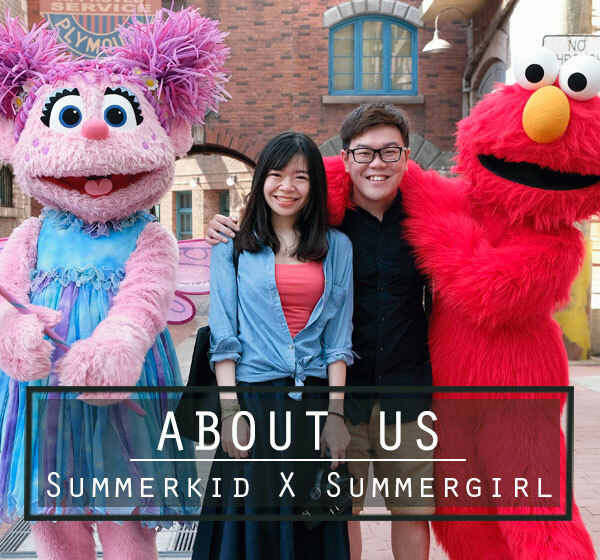 Sumergirl No.1 Korean street food favourite. Fluffy cake at the botton, topped over with egg and cheese. 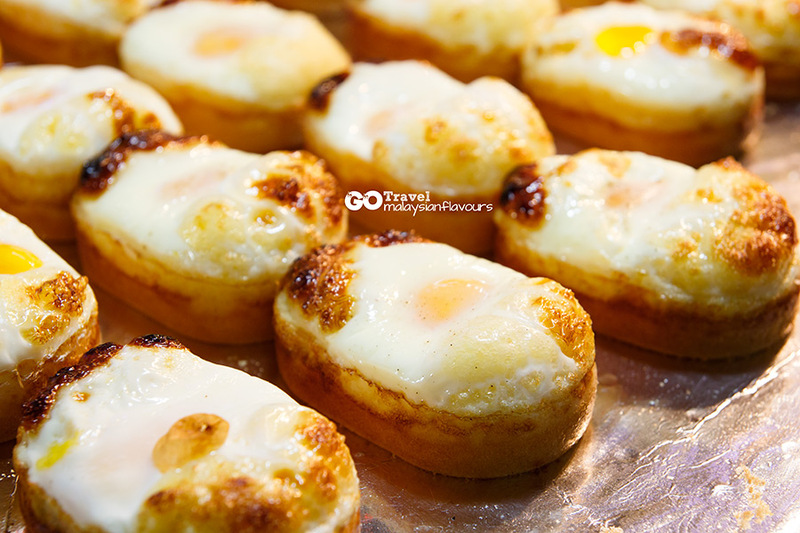 A sweet and savoury combination, filled with eggy aroma. We had this few times in different places. 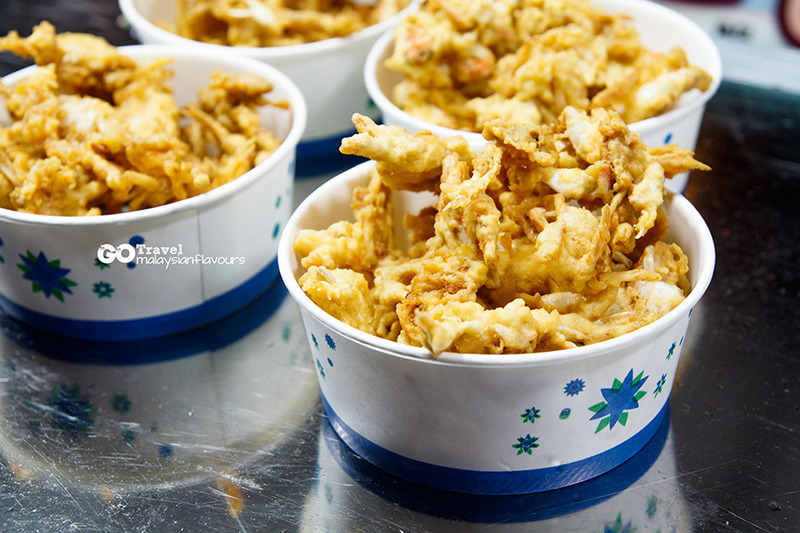 Our first hotteok was in Nami Island. That was good but back in Myeongdong, the one we bought tasted quite bad. 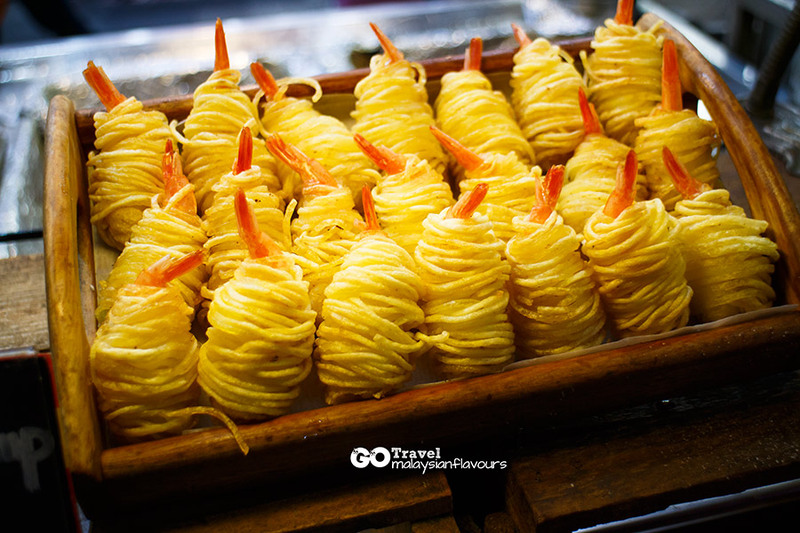 We felt like tucking into a thick layer of oil, lack of crispy outside, chewing within texture with a burst of melted brown sugar sweet sensation. More like a gimmick to attract customers. 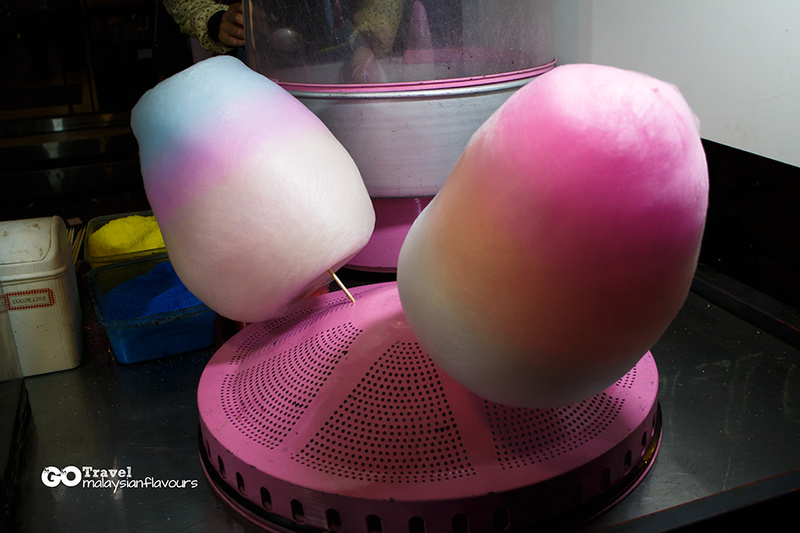 Cotton candy, laced with rainbow colours to please. Summergirl favourite. The winning point goes to the spicy sauce with a tinge of sweetness. Some do it well, some make it way too cloying for the sauce. 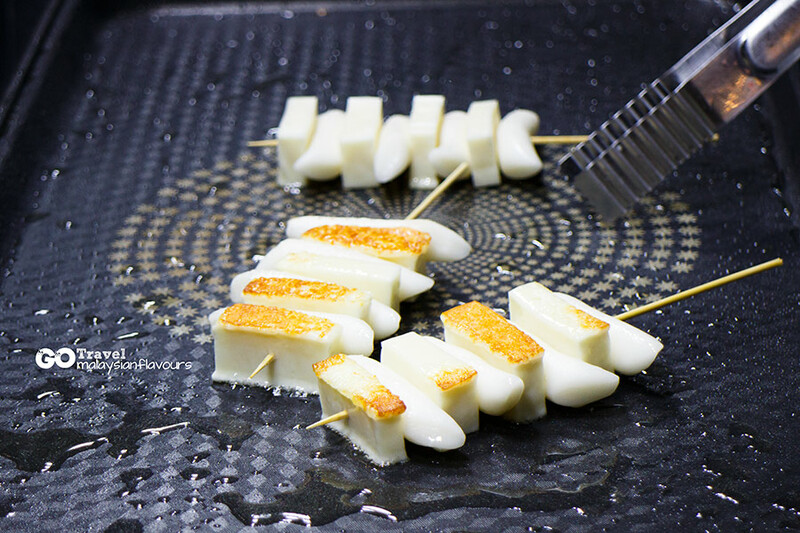 Koreans make good use of their rice cake in different cooking method. Boil in soup, stir fried in sauce, and even grill it for a layer of crispiness. 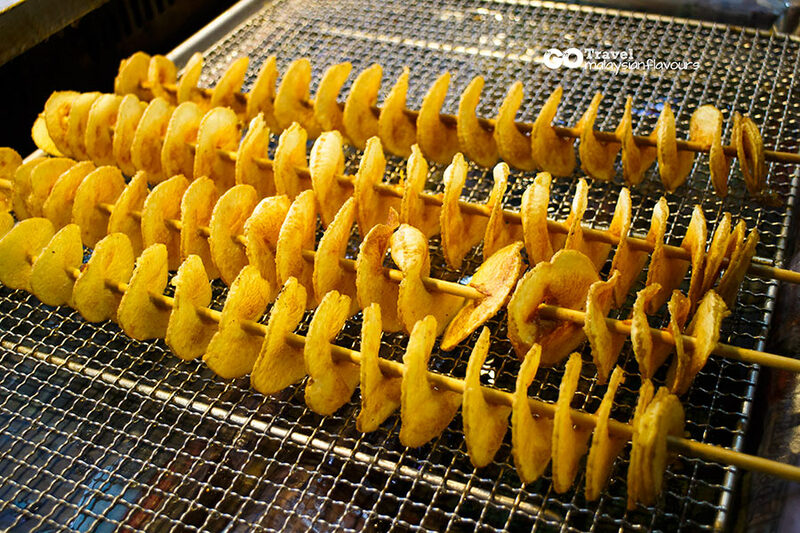 Not something new to us though, as Malaysia night markets are flooded with this tornado-like potato chips. 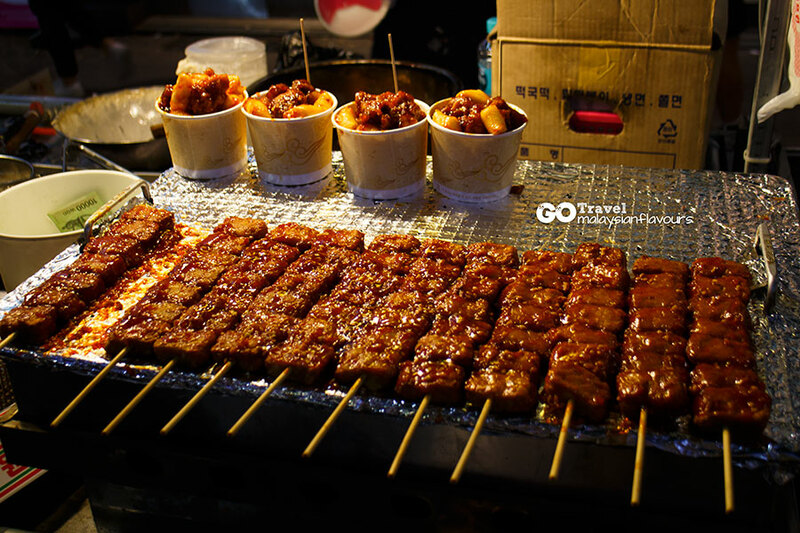 For Korean version, some place a long sausage at the hollow center for more flavours and texture. Didn’t try this out but you can get it in Malaysia now too. 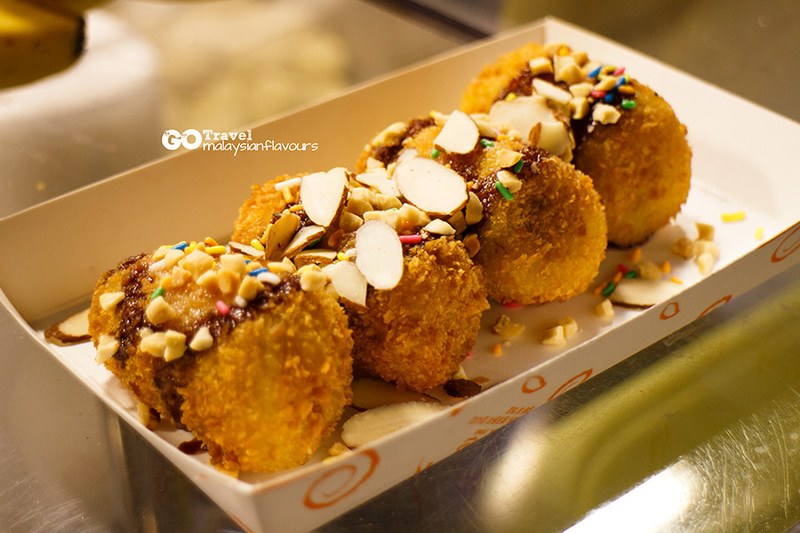 The famous Aboong Korean fish waffle ice cream has just opened a store in SS15 Subang Jaya. Octopus leg cut into pieces, grilled and topped with sauces and bonito flakes upon order. Hard to chew, we didn’t eat till the last piece. Something you will like or stay away from. 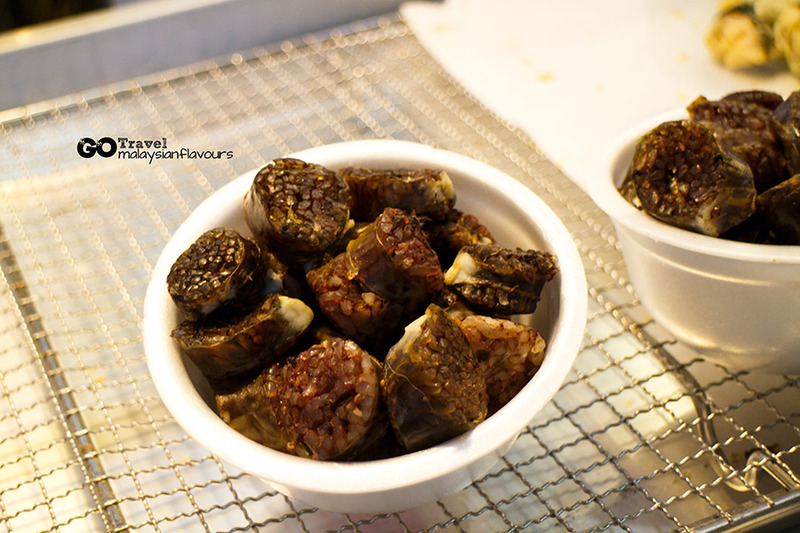 It is normally made from pig blood with glutinous rice and noodles, leaving chewy, mochi-like texture. 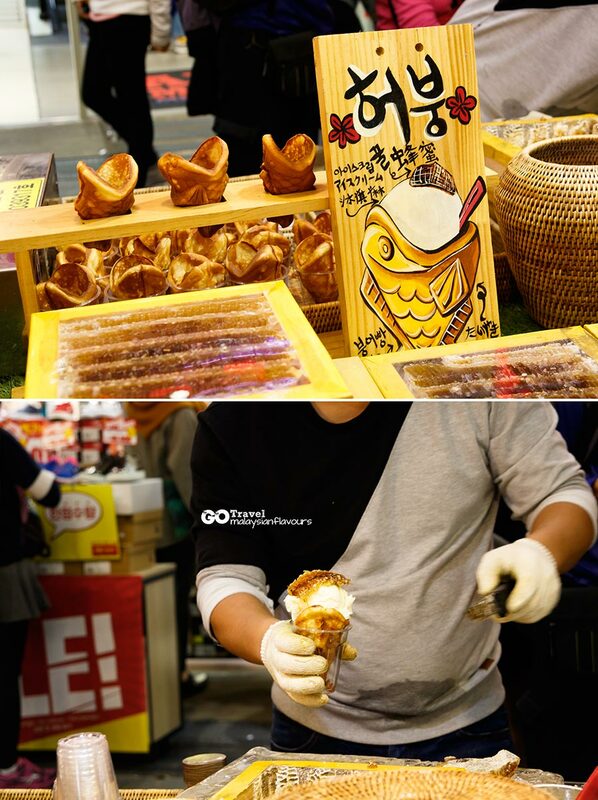 Never thought we will see Pisang Goreng in MyeongDong night market hahaha. Too many food and need some drinks? 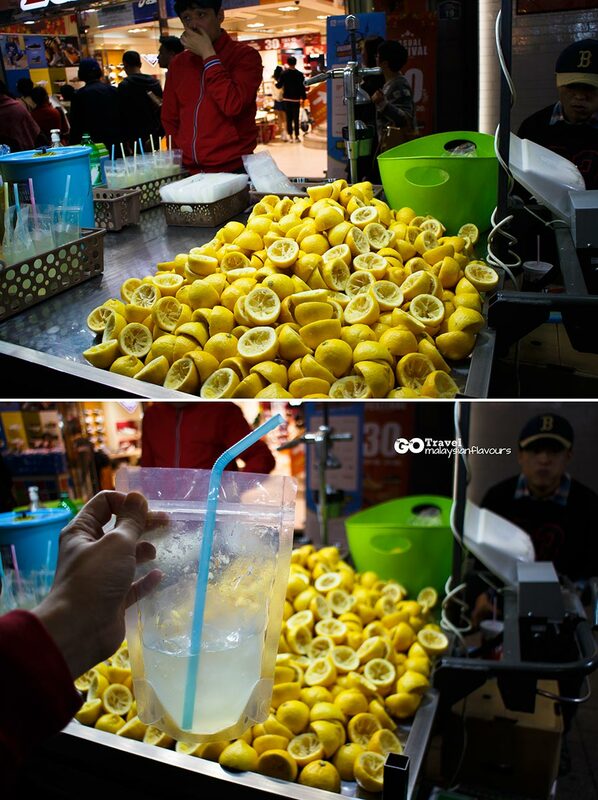 You can always buy a packet of freshly squeeze lemon juice to quench your thirst. This Japanese water cake appears like a big drop of water. 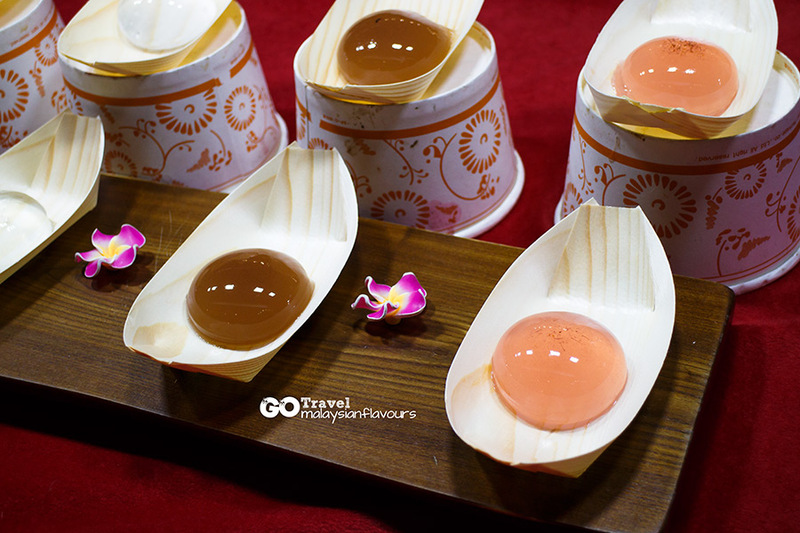 It is actually a Japanese jelly with smooth surface, transparent, mildly sweet. Taste good. 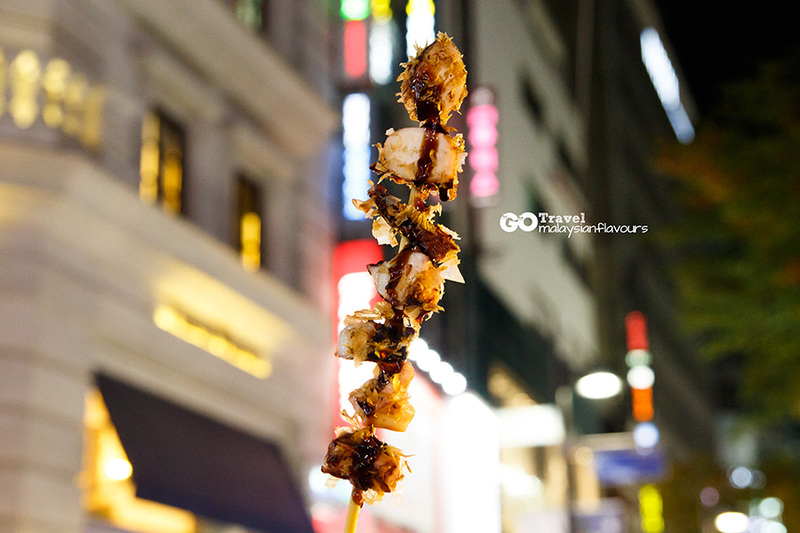 For next trip to Myeongdong, we may focus more on coffee places and Korean BBQ Restaurant instead of testing out Korean street food along the road. We can easily get cheaper, better one in other area.